Tobias Harris will give Stan Van Gundy flexibility at both ends of the floor for the Pistons. AUBURN HILLS, Mich. – The Detroit Pistons announced today that the team has acquired forward Tobias Harris from the Orlando Magic in exchange for guard Brandon Jennings and forward Ersan Ilyasova. Harris, 23, has appeared in 49 games this season for Orlando (all starts) averaging 13.7 points, 7.0 rebounds, 2.0 assists, 1.0 steals and 32.9 minutes per game. He’s scored in double-figures 39 times, recorded 20-plus points six times and tallied a season-high 30 points vs. Oklahoma City (10/30). He’s recorded 10 double-doubles this season while shooting 46.4% from the field, 31.1% from three-point range and 78.4% from the free throw line. In 68 games with the Magic last season, Harris averaged a career-high 17.1 points per game (28th in the NBA) and ranked 17th in the NBA in minutes per game (34.8 mpg). The 6-foot-9 forward has appeared in 275 career games (191 starts) in four-plus seasons with Milwaukee and Orlando holding career averages of 12.9 points, 5.8 rebounds and 1.4 assists in 27.7 minutes per game. Jennings, 26, appeared in 23 games this season (one start) with Detroit and averaged 6.8 points, 2.0 rebounds, 3.0 assists and 18.1 minutes per game. The 6-foot-1 guard missed the first 31 games of the season while working his way back from a ruptured left Achillies suffered at Milwaukee on 1/24/15. Jennings appeared in 41 games last season prior to suffering the injury and averaged 15.4 points, 2.5 rebounds, 6.6 assists and 1.1 steals in 28.6 minutes per game. The California native was acquired by Detroit from Milwaukee in exchange for Brandon Knight, Khris Middleton and Viacheslav Kravtsov on 7/31/13. 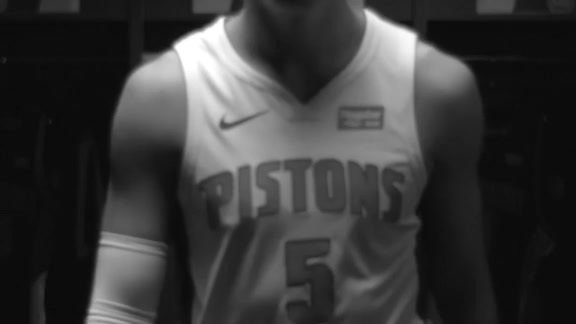 Ilyasova, 28, appeared in 52 games with Detroit this season (all starts) averaging 11.3 points, 5.4 rebounds, 1.1 assists and 27.6 minutes per game. He was acquired by Detroit this past offseason from Milwaukee in exchange for Caron Butler and Shawne Williams (6/11/15).